Leave Me the Birds and the Bees - Please! When I am on walkabout, I try hard to not make comparisons. “Be in the moment,” I tell myself. Why spend time, money, and effort to be in one place, and mentally be someplace else? But sometimes I can’t help myself. We were walking along a palm studded white sand beach on Pangkor Island, Malaysia, and I found myself singing an old Joni Mitchell song. 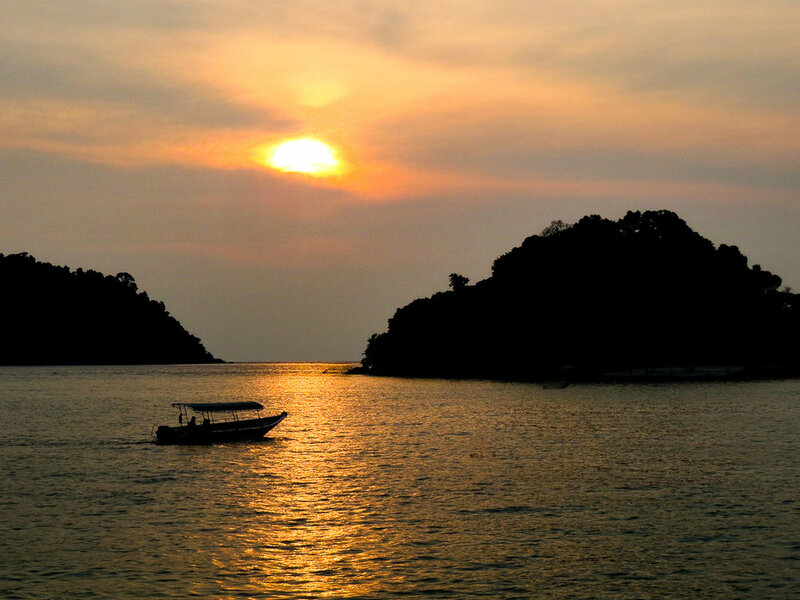 It took a lot of effort for my skilled and knowledgeable travel partner and me to get to Pangkor Island, Malaysia. This trip to a popular Malaysian destination beach, reminded me why I live in clean and green Washington State. Our journey started at Fraiser’s Hill with an hour and a half taxi ride from hell, then we jumped a commuter train, a second metro train, a six-hour bus ride, an overnight stay (because we missed the last boat of the day), a ferry the next morning, and another short taxi ride, all to get to Vikri Resort on the West side of Pangkor Island, Malaysia. We learned two lessons, 1) Google maps doesn’t know everything, and 2) more than five transfers in a day is taking a big risk that you are going to miss a connection. That is exactly what we found. We also saw hornbills, monkeys, and cute little white shells on the beach. We rented a scooter for two days. “Keep on the left” I would remind Keith and we made up a little song to sing. “Keep on the left,” were the only words sung to various melodies. On our scooter ride around the island we stopped at a beautiful new mosque over the water. Parts of the island were quiet and peaceful. We had a beach view from our cabin room, and a tasty home cooked meal. Just a short distance away from the resort, we watched beautiful sunsets looking toward Indonesia. Walking along Vikri Beach, the water was warm but not what I would consider “clear.” The sand was rough on my bare feet. After seeing a rusty can with sharp edges, and a dead spiny urchin, I put on my shoes. I also noticed that there were no sand flies, no sand crabs, no gulls, no seaweed, and no little sandpipers running from the waves. But, that did not comfort me. It got me thinking about how hard it is to keep water clean when development encroaches into an ecosystem. When we visit beaches in California, Oregon, and Washington, we seldom swim, but we do look for tide pools, watch the gulls and birds grab little creatures out of the sand, and try to identify all the sea creatures we find. Our beaches are so alive! Shellfish are everywhere, full of little sea creatures. It has been a long hard fight to keep our waterways clean. I was singing along with Joni forty-years ago. And, we are still fighting to keep the Clean Water Act viable. When we traversed the island, we saw numerous high-rise buildings partially constructed, appearing to be vacant or abandoned. It was if there was a title wave of new construction interrupted by economic crisis. Pangkor Resort World was not thriving. It was very quiet. Do they know what valuable gems they have in the island’s beaches, waterways, and ecosystems? An old sign for an unfinished resort complex. I don’t want to be “The Upper Left Coast Traveler,” but Pangkor Island reminded just how lucky we are in the great Pacific North West. Leaving the island, we took a big pink taxi, a ferry, and a walk to the bus stop. After a four-hour bus ride, we took a ferry and a taxi to our next apartment in George Town, Penang, Malaysia. All the taxi’s on Pangkor Island are pink and yellow. It takes a lot to get to a beach resort in Malaysia, and I’m glad we made the trek. I hope Pangkor Island will always be worth the effort.